Compliments of the season people! 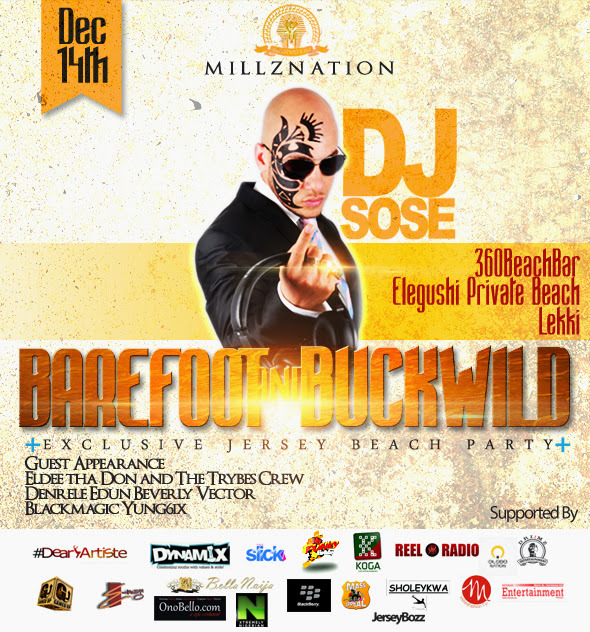 It’s the season to be merry, what better way to kick off the festivities than with MillzNation “BAREFOOT AND BUCKWILD” Jersey Beach Party @360 BAR AND LOUNGE ELEGUSHI PRIVATE BEACH 2013. As MillzNation Activation Party, Barefoot & Buckwild would feature popular celebrities, spin crowd from the media & select bloggers who have been Millz friends over the years. So hurry and order your jerseys/ invites now, for a fun time of networking while partying. Proudly Supported By: Byak360, 360 Bar And Lounge, Drim:Ent, Gray Tiger, Blackberry, Reel Radio, Slick Empire Entertainment/Tv, Dynamics Tv And Magazine, Koga Tv, Gamedup Tv, Bellanaija, Ono Bello, Dearartiste, Unilag Olodo, Entertainment Connect, MillareFashion, Steez, Sholekwa Stores, E-Mage, Blowfish Suites, Massappeal, Nigezie, Thenet.Ng, Venessa Michaels Blog.